Shmaltz Bock Bock has spent months in a blend of bourbon barrels, including Jim Beam and Wild Turkey barrels (for the 2016 release). “Barrel-aged Bock Bock gains its toasty, rich malt body and nutty caramel flavor from distinctive European malts, such as Vienna, Munich and Crystal, to make a traditional bock base,” said Shmaltz Brewing Company’s Lead Brewer Richie Saunders. Shmaltz Bock Bock Imperial American Bock Lager is available in 22oz Bottles and draft. Straight to Ale Bock Rogers is the latest release from the Huntsville, Alabama based brewery. Bock Rodgers started as a taproom only release (along with a few festivals. As its popularity has grown, Straight to Ale figured it was time to bottle this space traveller. Bock Rogers, a 7% ABV traditional German bock with a cosmic flavor beyond all comprehension. It is no freak mishap that each and every bottle contains a malty, coppery brown beverage that is rich, toasty and filled with hints of caramel. Robust and lightly sweet with only 30 IBUs, it is a perfect beer for Earth’s winter months and will provide satisfaction beyond imagination to the discerning beer lovers of this planet. Straight to Ale Bock Rogers is available in 22oz bottles and draft. 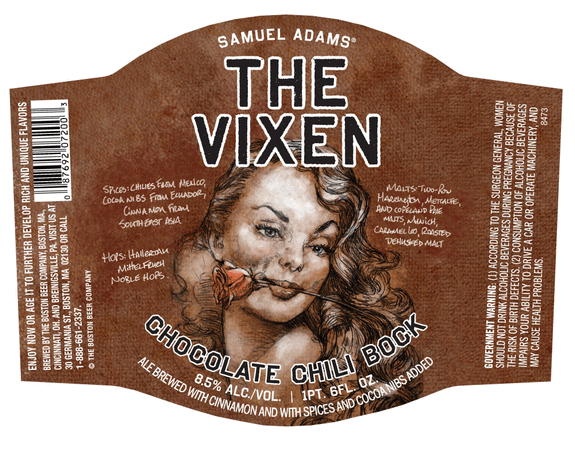 Sam Adam’s The Vixen Chocolate Chili Bock is going to get a little sexier. The brewery looks to be overhauling the artwork for future batches. The chili beer was first released in 2011. Widmer Brothers Brewing (Portland, OR) continues their 30 Beers for 30 Years celebration with three bottle releases this month. Local Portland artists created the labels for each of the new beers. These next releases transport Widmer back to their German brewing roots. 30 cases of each will be available solely in the Portland, Oregon market starting this week (of May 5, 2014). Ethan Allen Smith of Peetkegler created the Festbier label, Adam R. Garcia of The Pressure created the Mäerzen label, and Andy Morris of Chandelarrow created the Bock label.